EURAXESS provides practical support to researchers as they relocate for work. Through the EURAXESS Centres, EURAXESS helps employers save time and money by assisting new employees with the move abroad. You can enter the Republic of Slovenia with valid identity card or passport and entry permit. Entry permit can be visa or residence permit. There are two different procedures of obtaining entry permit: one for EU, EEA and Switzerland citizens and one for citizens of all other countries. In order to work in Slovenia, foreign researcher that is not from EU or EEA country also has to have work permit. Visa applications are submitted at appropriate diplomatic representations of the Republic of Slovenia. Residence permit can be temporary (up to 1 year) or permanent. Residence permit is issued at diplomatic representation or administrative unit in Slovenia and can be renewed. It can be combined with working permit (Unified residence and work permit). Special type of residence permit is a EU Blue card – a residence permit valid for up to two years for highly qualified employment. Work permit as such is issued only as “Unified residence and work permit”. Unified residence and work permit are issued at administrative units. Researchers and tertiary education teachers with hosting agreement with research or tertiary education organisation in Slovenia do not need work permit. However as soon as researcher or tertiary education teacher wishes to sign employment contract, he or she needs work permit. EURAXESS provides free services that can help researchers and their families relocate with confidence. EURAXESS can save employers time and money by helping their new employees make the move abroad. More than 260 EURAXESS Centres operate in 40 European countries. Trained and experienced staff are just a phone call away, and can provide personalised assistance on a range of issues including visa requirements, work regulations, taxation and social security. Finding an accommodation can be very demanding task further complicated by language barriers. Feel free to contact any EURAXESS center and ask for help. Life in a foreign country can be a daunting prospect. EURAXESS network is here to help. Read our or contact one of EURAXESS centers. 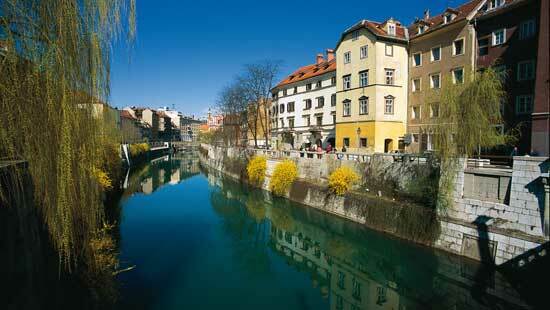 Many private schools are offering quality language courses in all major cities in Slovenia. Even if Slovene is considered a difficult language to learn, you will find it interesting once you start learning it. One of the options is the Centre for Slovene as a Second/Foreign Language. The Centre operates under the auspices of the Department of Slovene Studies at the Faculty of Arts of the University of Ljubljana. The programme offers a varied selection of language courses, differing in length, intensity and goals. You can also learn Slovene on-line (In Slovenian language) before your arrival in Slovenia. The course is divided into three levels and you can learn Slovene with the help of written texts as well as audio and video recordings. Official Language: Slovenian, in some nationally mixed border areas also Italian and Hungarian. You can find Slovene language basics Pocket Slovene publication. Slovenian food reflects mixing of cultures and traditions: sausages, sauerkraut, potato dishes and strudels from North, goulash, paprika and pancakes from East, pastas, risottos, žlikrofi and pizzas from West and burek (baked pastry filled with different fillings), čevapčiči (minced meat rolls) from South. Latest trends include artisan beers and hamburgers. Slovenian wines are particularly recommended. Researcher mobility can improve a career in research. Research is global with collaborations across borders a standard. The transfer of knowledge is crucial to pushing the boundaries of science. Make the move and discover the wealth of opportunities on offer both inside and outside Europe. EURAXESS Centres and EURAXESS Worldwide are on hand to offer expertise and advice to facilitate your move abroad. Arrange departure formalities with your employer and administrative unit, pack all your good memories and come back for another visit.